The Wren's Nest was the home of Joel Chandler Harris from 1881 until 1908. 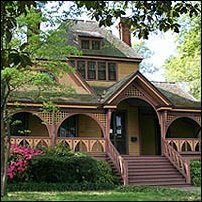 The structure is one of only a few remaining Queen Anne Victorian homes in Atlanta and is a unique example of upper middle class living around the turn of the 20th century. Today the home features most of the Harris family's original furniture and belongings. The house was named after wrens made a nest in the mailbox 120 years ago, and in 1962, the National Park Service designated The Wren's Nest a National Historic Landmark. Between 1985 and 1992 the Joel Chandler Harris Association restored the interior and exterior, and in 2009, the administration completed a $190,000 conservation project. Parking: Free parking is available. MARTA: Take the Red or Gold Line to the West End station. The Wren's Nest is approximately five blocks west of the station on Ralph David Abernathy Boulevard.